Ah, Flipboard. One of my favorite apps, particularly on the iPad. I am not the only one. The app claims 90 million users. With the huge user base, brands are trying to find a way to add this outlet into their marketing mix. Guess what? Banana Republic seems to have found the answer through Flipboard’s magazines. Flipboard released the ability for brands to create magazines ( a.k.a. catalogues) earlier this year. A Flipboard magazine is simply a group of chosen content (links) that pull in images and text in an eye-catching and appealing way. Users can subscribe to the created magazines and therefore be served content from the magazine creators. In Banana Republic’s case, the company created a variety of different magazines. For example, they have one magazine called the “black-and-white shop”. 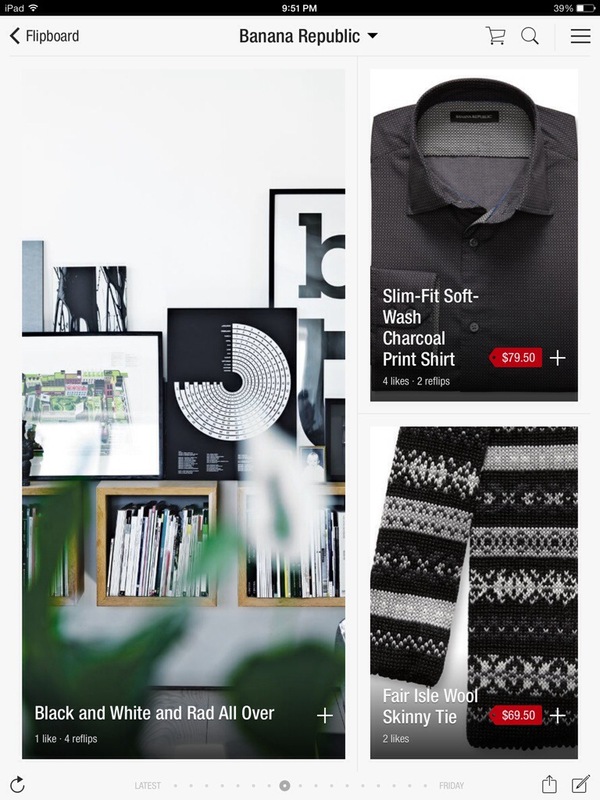 The Banana Republic black-and-white shop magazine shares various content about their latest black-and-white products and also provides related lifestyle links. From a product standpoint, the catalogue shared black-and-white products from BananaRepublic.com, including white striped purses, black blazers, and grey duffel bags. From a lifestyle standpoint, Banana Republic provided a link to information about black-and-white Thanksgiving decor ideas. Other Banana Republic magazines include the print shop, the deluxe shop, the ski shop, the candy shop, the plaid shop, and the shimmer shop. Each magazine contains products and lifestyle tips specific to its theme. 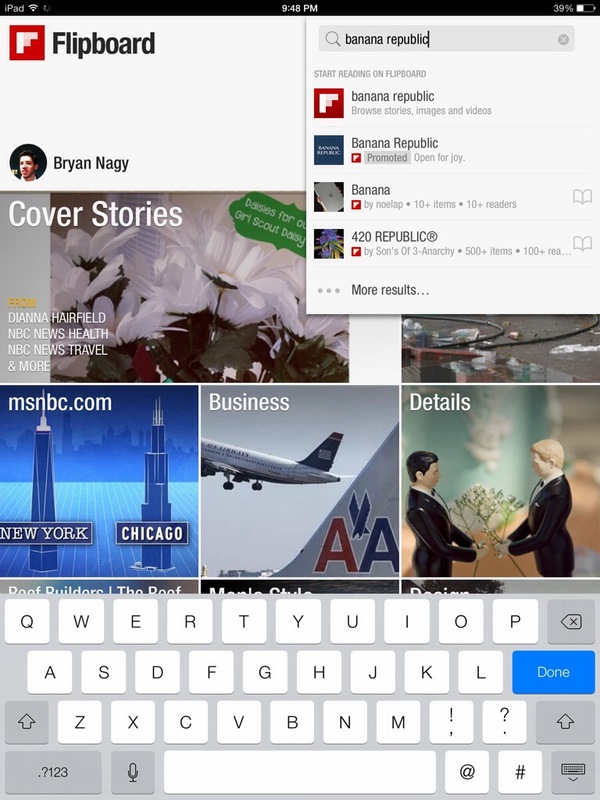 What exactly can users do with and a Banana Republic magazine on Flipboard? 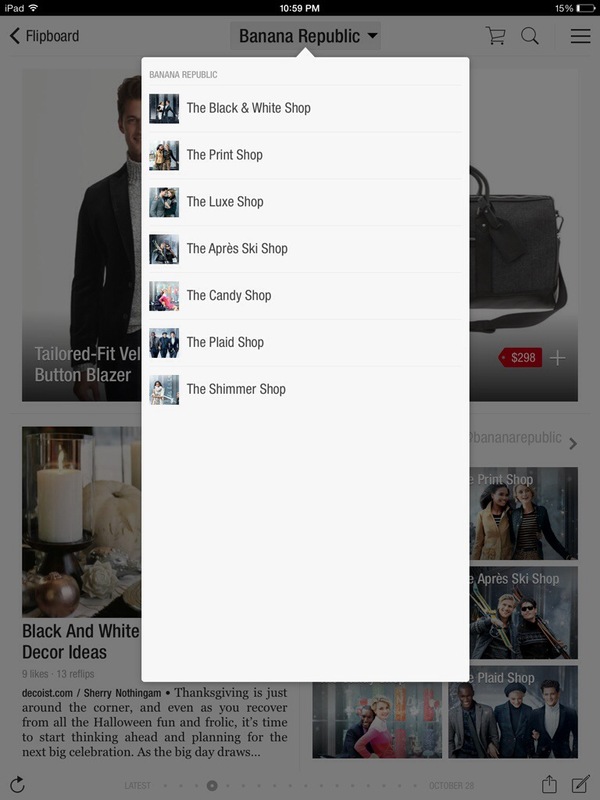 Product content links to the product on the Banana Republic website, allowing customers to purchase the product within the Flipboard interface. In addition to purchasing, users can like the products on Flipboard, reflip the products into their own custom magazine, share them with friends, and comment on them. This leaves room for a ton of engagement possibilities, not to mention possible sales. The key draw to Flipboard magazine for Banana Republic is the platform itself. It is extremely image focused, meaning content is eye-catching, appealing, and very professional. It’s like creating a high-quality catalogue, but with the ability to easily update it, engage, and be somewhat inspirational to your customers. It’s also a platform that users spend a lot of time on, so they’re more likely to actually look through the content that you have shared. 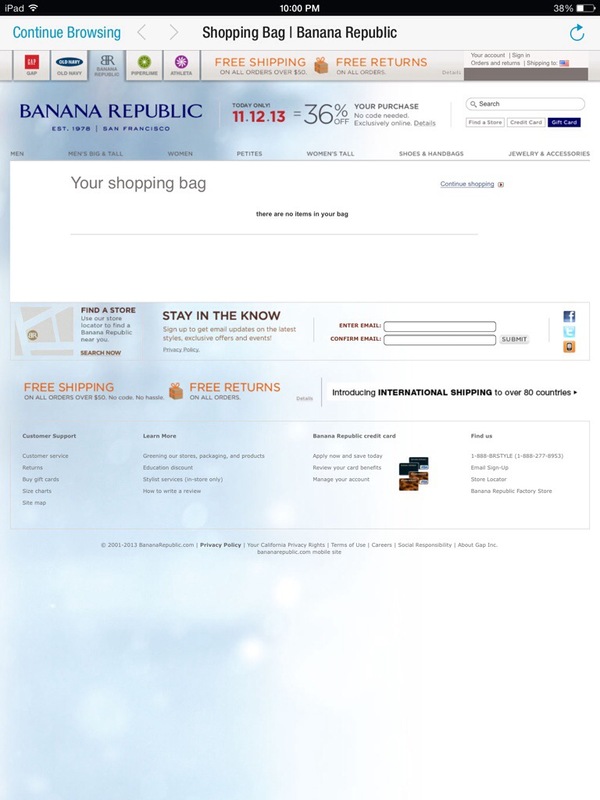 The main issue right now for Banana Republic, is the ability for users to find this content. Currently, the only way Flipboard allows users to discover the Banana Republic magazine is to either search for it in the search bar or discover it through ads within the platform. The ads, however, are not very frequent, so it’s likely that many users are missing out on potential interesting content. Hopefully, Flipboard will offer more opportunities in the future to increase exposure of these brand magazines. Flipboard really is a great platform for brands since it is so appealing and The amount of time user spend on it.